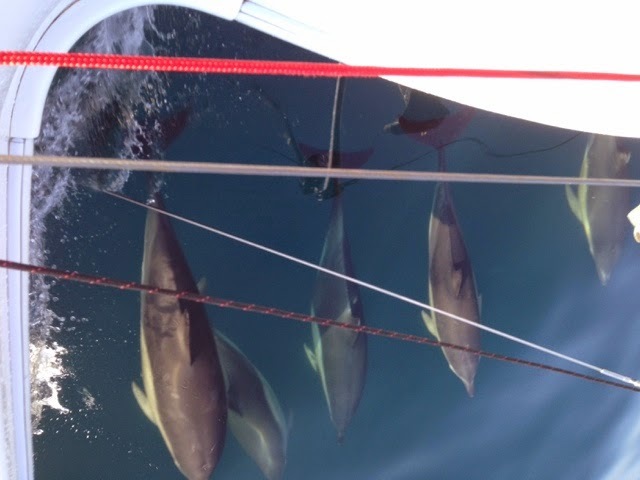 Yacht Alexandria - Circumnavigation of Britain: DOLPHINS!!!! A pod of 7 dolphins including a young one just spent 30 minutes surfing between the two bows. We were travelling at 7 knots so they covered 3.5 miles effortlessly. Spectacular! View from the bows of the yacht attached. Later a pod of 10, came rushing head on and then dived under the boat, jumping out of the sea, and just having fun. When we stopped you could hear their squeaks. Alastair saw a whale surface twice and heard its blow.